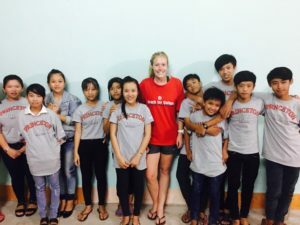 Our first conversation is with Sarah Mendenhall ’17, a member of the Princeton women’s soccer team who traveled to Hoà An, in the Mekong Delta Region of southern Vietnam. My trip to Vietnam was filled with amazing experiences. I was so excited to learn that I had been chosen by Princeton to attend Coach for College. Originally it was just an idea, but it soon started to set in that I was actually going to Southeast Asia for a month! I was so nervous, but meeting with the other Princeton students made me really excited to go to Vietnam! Once arriving in Vietnam after 30 hours of travel, it is a huge culture shock. Mopeds are screeching by in every direction, you are meeting new people that you will be working with for the next month, and your diet instantly revolves around rice. Once I was settled down in Vi Thuy, which is about 6 hours south of Ho Chi Minh City, life was so different than life in the United States. When school started, we woke up at 5:30a.m. to workout at the track, which was a five minute run away from our guest house. We had breakfast, showered and then left for school at 6:50a.m. School started at 7:10a.m. and went until 5:30p.m. We alternated between academic classes and sports lessons with 8th graders in the morning and 9th graders in the afternoon. I taught Biology and Soccer, and loved it! After school, we would come home to dinner and then start lesson planning for the next day. Lessons in biology were challenging to teach at times, I didn’t know any Vietnamese before, and even though I had learned a little, it was never enough to teach my students anything. I think that trusting your translators is really important within the classroom. I tried really hard to be as energetic as possible allowing my teaching partner and I to put a lot of effort into visual aids so you did not need a translator to explain. For instance, we taught one lesson on bones and muscles and we made a knee joint out of rubber bands and sticks. The kids thought it was really cool and it only took us 30 minutes to make. The kids were great! I really was able to bond with them in the short time we had together. The relationships were built from the experiences we shared together in and out of class. Some kids were easier to understand than others, but even though I could not communicate with them in words, I felt like I knew all of their personalities really well from watching how they interacted with each other. I don’t know if I can say that I had a favorite moment from the trip, but something or more someone who really made my day was a young girl named Nha Truc. Her parents owned the guest house that we lived in. Every day coming home from school Nha Truc would be standing on the porch waiting for our bus. As we pulled in, she would be waving at everyone on the bus and would give us hugs as we got off. She was five years old and couldn’t speak any English, but I loved how much we got along from the very beginning. How have you changed as a result of participating in Coach for College? What is the most important thing you learn/realized from this opportunity? My experience in Vietnam was eye-opening and I would recommend this program to everyone. You had to work hard every day and you live like an average Vietnamese from Vi Thuy. This is an experience I think everyone should have in their lives, as you get to see how people outside of America live. I became so thankful for things that I took for granted at home and I think I will always remember the people I met on my trip. Anything else you want to share about your experience? Thank you so much for the opportunity of a lifetime! Coach for College is a great program, as it gives student athletes the opportunity to go abroad. The other Americans that also did CFC were amazing. They made the trip amazing and I know I have made lifelong friends because of all the memories we share.